Daisy came to us as a puppy. She was too shy to race and flunked out of training because she just was so scared that she couldn't really be handled by people. It took months of patience to be able to get this shy little girl to warm up and by that time her foster home decided to keep her. Daisy came from a farm near Tallahassee Florida and was going to race at the now closed Jefferson County Kennel Club Race Track if she had made it through training. Her farm was near that track and her owner had a couple of race kennels there. Some of her littermates weren't as shy and did race there. Daisy never actually finished her registration process and didn't get an official racing name since she flunked out of training. Daisy was born on March 15th 2004 and we got her just a little over a year later. Daisy warmed up to her adoptive family but was always afraid of children because she had never seen kids at her farm. Daisy's sire was Tame Game and her dam was Barts Cookie. We ended up placing 6 of her littermates. Only two of them were as shy as Daisy. 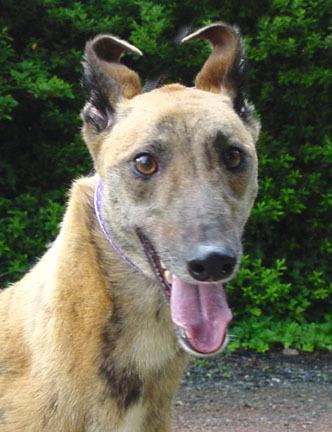 She was one of the fuzziest greyhounds we have ever seen with a thick coat and very fuzzy tail. Daisy lived with the Owens family for 13 years and passed away at 4.5 years old in October of 2018. Be sure to look at her other pictures to see how much her coloring changed over the years.